Sauerkraut variations exist all over the world. It could differ in taste and appearance significantly from one country to another, but it’s always made of lacto-fermented cabbage leaves. And as other fermented products, it has a lot of health benefits. It’s an excellent probiotic food, rich in beneficial bacteria and electrolytes. It's also a valuable tool, for those who try to heal their gut and/or normalize its functioning. In Ukraine, same as in Russia, cabbage is usually pickled with some carrots, and then served cold, mixed with chopped onions and dressed with virgin sunflower oil. Every time when autumn comes I start to make sauerkraut. I’m not sure why but year after year my family starts to crave Ukrainian sauerkraut around October and says that they don’t want it anymore around January. But those 4 months I make fermented cabbage regularly and always have it in my fridge. 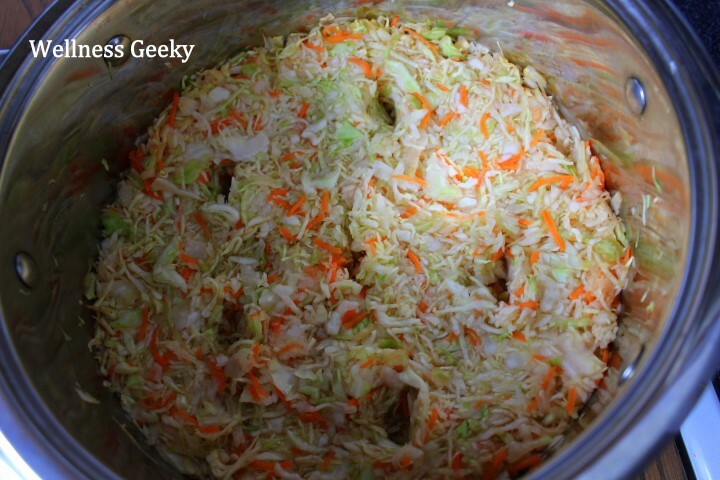 It’s pretty easy to make fermented cabbage and it can be stored in fridge for a couple of months. Though in our family, I need to make it by buckets in order to have something to store for so long. First step in the process is to choose proper cabbage for your future sauerkraut. The larger the better – In order for cabbage to ferment properly it needs to be juicy. The inner whiter part of cabbage tends to be juicier, and the larger cabbage will have more white than two smaller. Autumn cabbage is the best – autumn, denser cabbage is better for sauerkraut than summer fluffy verities. The whiter the better – as I already told you for pickling you need juicy lighter inner part of cabbage. And cabbage is often sold with lots of outer leaves. You better skip such cabbage, as you don’t know how many layers you will need to strip off before you get what you need. Something to chop or shred cabbage and carrots with – It’s could be as simple as cutting board and sharp knife, though such things as vegetable slicers (mandolin slicers) or food processors with option to shred will help a lot. I own this Braun Food Processor and it’s doing a great job in multiple tasks including shredding vegetables. A plate or a lid to put on top of cabbage. It should be smaller than bowl’s diameter, so it is literally lying on sauerkraut. Chop or shred cabbage in small and thin strips. Grate carrots with the available tool. Combine cabbage with carrots and add salt. 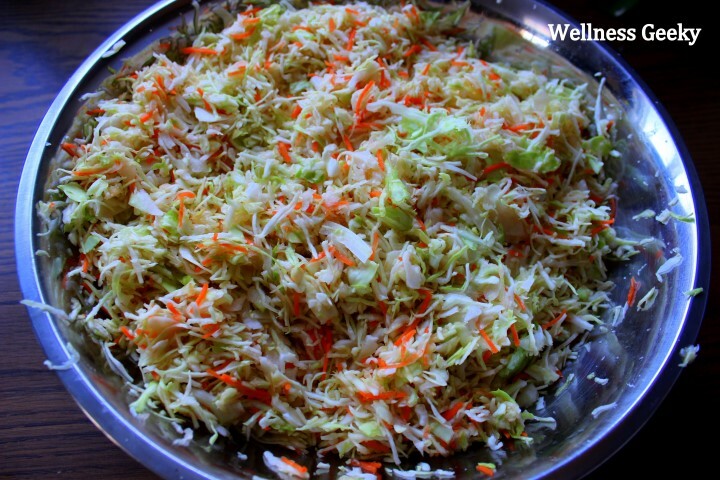 You need add the same amount that you would add when making cabbage salad. Taste it, you should feel salt, but it should not be over salted. It’s much easier to mix everything together with your hand, rather than with spoon. When doing so squeeze cabbage lightly (it will help cabbage to release more juice). Press sauerkraut into the bowl as firm as you can with your fist. Fill the jar with water and put on top of the plate. From 5 minutes to an hour you should see juice/brine covering cabbage. If you don’t see any brine, look for the solution below in troubleshooting section. In 36 to 48h you will start to see foamy bubbles on the brine surface. 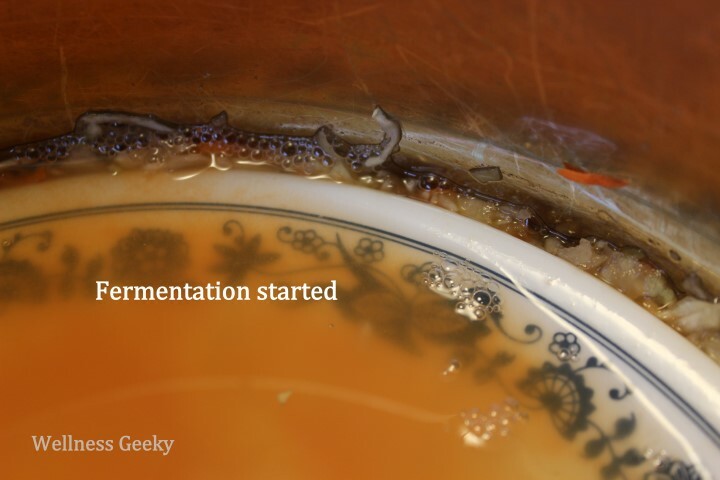 It’s a sign that fermentation started and you need to take off weight and remove plate/lid. Nerdy note: you’re putting weight on top to expel any air. Absence of air will create favorable environment for anaerobic (doesn’t need air) lactobacteria and won’t let aerobic (use oxygen for their metabolism) bacteria to grow and rot your cabbage. Take a table knife or any other pointy kitchen tool and make holes in the cabbage or rather tunnels, as you need to reach the very bottom of your bowl. Tunnels need to be around 1 inch in diameter. Make 5 to 7 holes. You need these holes to ease escape of gas produced during fermentation. If you won’t do that your sauerkraut can taste bitter. Leave your cabbage uncovered to ferment for another 36 to 48 hours. 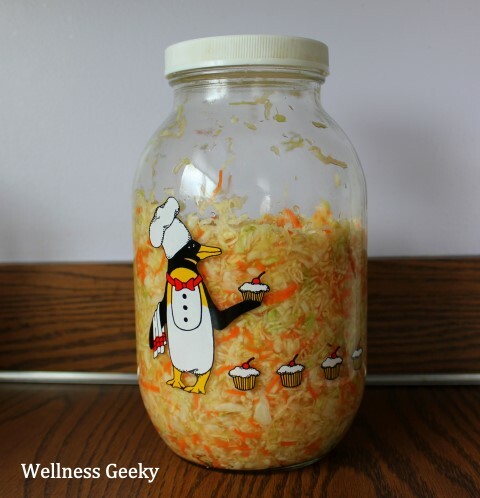 Transfer sauerkraut in the jar, packing tightly, and store in the fridge for up to two months. 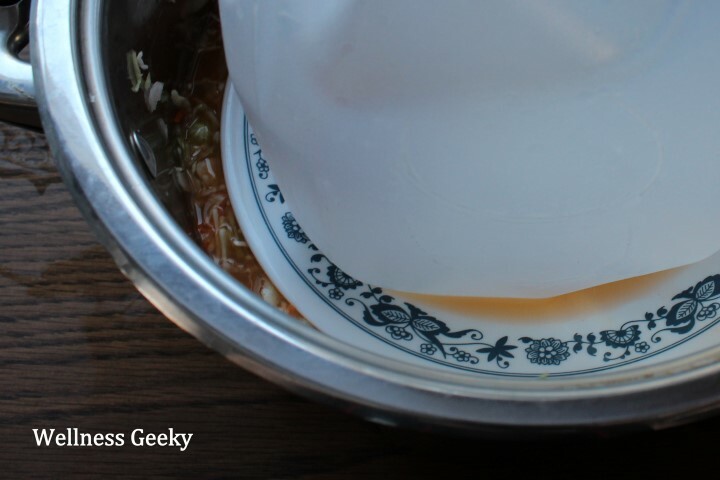 Transfer some sauerkraut into a serving bowl. Press out any brine back to the jar. Chop one small onion in thin quarter rings or small cubes and add to sauerkraut. 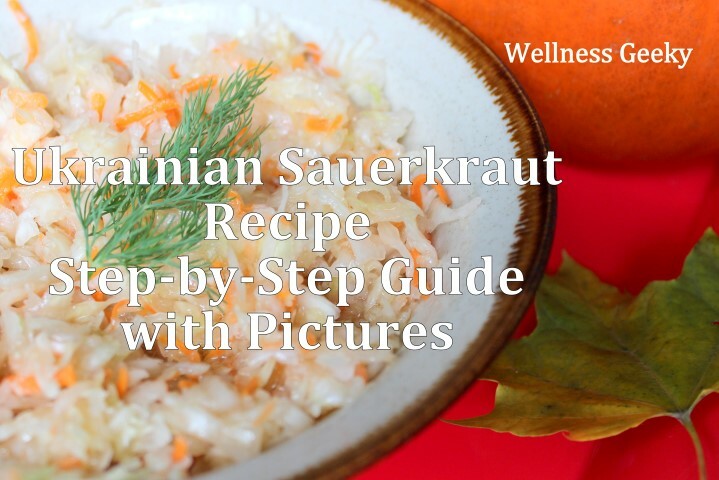 Traditionally Ukrainian sauerkraut is dressed with virgin sunflower oil. You can buy it at any Russian or Ukrainian store and online (it will cost more). A: Dissolve 1/2 teaspoon of sugar and 1/3 of teaspoon of salt in the glass of water and add it little by little to your cabbage without removing weight until you see brine rising. A: Rinse sauerkraut under cold water, press out any water and dress as usually. Rinsing will remove excess of lactic acid. Have you ever made sauerkraut before and how it ended up, share below?